Our Mapumental software shows journey times on a map, with exciting results. But there’s more: combined with other datasets, it can answer a wide variety of questions, be put to a wide variety of uses across many industries. Most recently, we worked on a version for the Dolphin Square Foundation. Their remit requires them to find properties within a specific travel time from the centre of London, and with the best net yield—a perfect challenge for Mapumental. You can read what we did here. You may see some similarities with our Mapumental Property, which combines house prices with transit time, so property hunters can see what’s available both within their budget and within a tolerable commute of their workplace. We’ve used Mapumental for many a time-based travel conundrum, like our project with the Fire Protection Agency that drew on fire engine response times to calculate risk-based insurance premiums for any given postcode. Or the work we did for the Welsh Government, plotting accessibility of schools. Like we said, Mapumental is flexible enough to work in all sorts of fields, for all sorts of purposes. Take a look at our Dolphin Square case study to find out more about its latest incarnation. From today, it’s much easier to buy transit-time maps from Mapumental. We’ve added a self-service shop which allows you to generate your own maps, instantly and easily. The technical amongst you may like to know that the service queries the Mapumental API; for everyone else, it’s probably enough to say that your maps will just appear, as if by magic. Mapumental maps are cheaper when you buy in bulk, so we’ve also integrated a credits system. 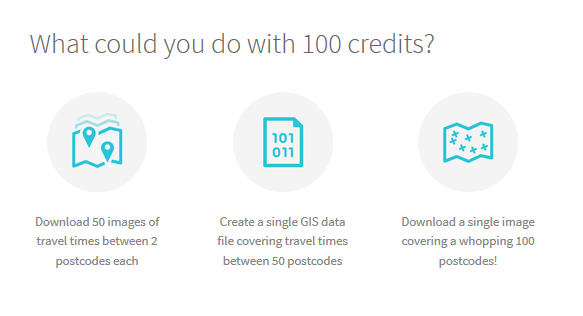 If you know you’ll have an ongoing need for our maps, stock up on credits (also completely self-service) and you’ll soon start benefiting from some substantial discounts. We’ve included a nifty little credits calculator on the page, so you can find the price band that best suits your needs. Check out the new interface at Mapumental now. All the benefits of a self-service checkout, none of those irritating “unexpected item in the bagging area” announcements.